Order two of these programmes and pay reduced price! Spend a minute to calculate your savings. Matthias Church was the scene of a big coronation ceremony when Franz Joseph and his wife Elizabeth were crowned, and thus the Austro-Hungarian Empire was established. The Opera House is one of the most beautiful buildings of Budapest. During the inside tour visitors may wonder around the theatre, admire Károly Lotz's ceiling frescos and the beautifully gold-gilt decorated boxes having a special atmosphere. A one hour sightseeing tour by night on the River Danube. The boat cruises among the illuminated sights of the city, while the deck TV screens let a glance into the historical buildings, presenting the life of kings, queens, poets, composers. Spend a magical night on the river Danube, in Budapest! While you are marvelling the unforgettable panorama of the capital city, we are serving you the delicacies of Hungarian and international cuisine with live music in the background. There are two versions of our programme. For details click here. We will take you on a 1,5-hour-long cruise with an excellent warm buffet dinner. After dinner you can also admire the panorama from the open upper deck of the ship. The salon music is performed by three members of the world-famous Rajkó Folk Orchestra. For details click here. 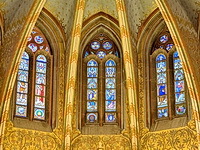 Enjoy an unforgettable organ concert in one of the most beautiful church of Budapest! The program of the concert is arranged specially for the organ of the St. Stephen Basilica by Miklós Teleki, and comprises works composed by the greatest masters.